Postsynaptic. SHANK proteins are elements of the postsynaptic density, linking synaptic transmission with the cytoskeleton. Deletions in SHANK2 and SHANK3 are known genetic risk factors for a broad range of neurodevelopmental disorders. The role of the reciprocal duplications, however, has remained unclear. In recent paper in Nature, a novel mouse model expressing a SHANK3 transgene is investigated. The results of a mere 1.5 fold overexpression of the protein are dramatic, hinting at unanticipated mechanisms that regulate the balance between excitation and inhibition. 22q13. SHANK3 is located on the terminal end of chromosome 22 and is the main responsible gene for the phenotype of the 22q terminal deletion syndrome, also called Phelan-McDermid Syndrome. This neurodevelopmental syndrome presents with intellectual disability, autism, and a prominent severe speech delay. In parallel to many other structural genomic variants implicated in neurodevelopmental disorders, the pathogenic role of the reciprocal duplication is less clear. The rare 22q13 duplication is enriched in patients with intellectual disability (7/15,000) and is absent in controls (0/8,000). SHANK3 appears to be the main culprit within this duplication, and in the recent publication by Han and collaborators, the authors identify two patients with smaller 22q13 duplications affecting SHANK3 alone. Interestingly, the phenotypes of these patients also include ADHD and epilepsy. But why does duplication of a single gene result in such a phenotype? Study by Han and colleagues. Overexpression of SHANK3 resulted in an unanticipated phenotype consisting of seizures and hyperactivity. On a cellular level, the balance between excitatory and inhibitory synapses was shifted towards excitation, suggesting that SHANK3 levels serve as a molecular regulator for the level of excitation versus inhibition. Hyperactivity and epilepsy. 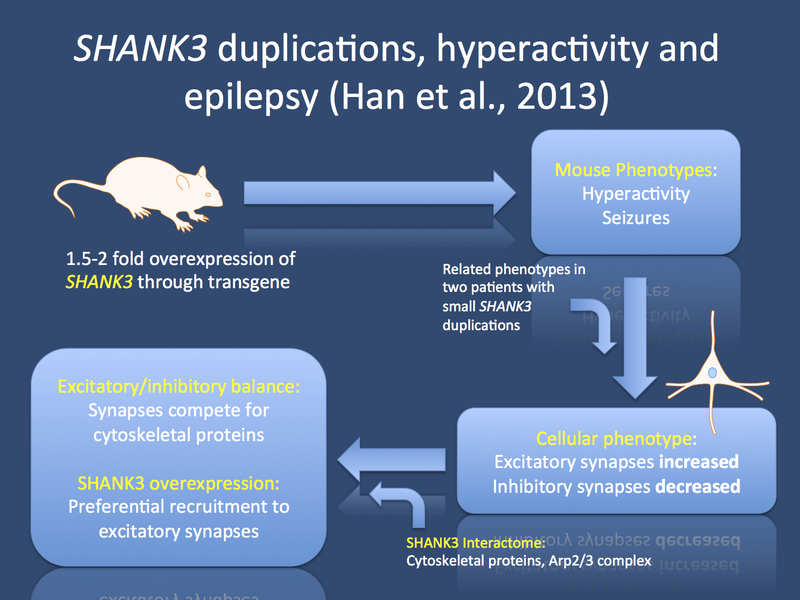 When Han and collaborators first generated the mouse model used in the current study, they were probably aiming to simply display SHANK3 in vivo rather than anticipating a phenotype in this mouse model. The authors generated a transgene combined with EGFP, a green fluorescent protein that makes it possible to visualize proteins in living cells. However, when looking closer, they realized that the animals showed signs of hyperactivity and seizures. Due to the transgene, SHANK3 was only expressed at slightly higher quantities than usual (1.5 fold), an increase in dosage that does usually not result in phenotypic differences. In a set of subsequent experiments, the authors investigated the underlying alterations on the cellular and molecular level. Neurons from transgenic animals showed an increase of excitatory, glutamatergic synapses and reduction of inhibitory, GABAergic synapses. Particularly the latter finding is surprising, as SHANK3 is exclusively expressed in the excitatory postsynapse. So why were the GABAergic synapses affected at all? A question of balance. Through a set of protein interaction studies, the authors identified an entire network of interacting proteins, many of which are related to the actin cytoskeleton. The Arp2/3 complex appears to be particularly relevant in translating the abundance of SHANK3 into the distribution of cytoskeletal proteins between various types of synapses. Basically, with increased SHANK3 protein levels, essential building blocks of the cytoskeleton are redirected from inhibitory synapses to excitatory synapses. The expression level of SHANK3 therefore represents an intracellular control mechanism to regulate the balance of excitation versus inhibition. While the existence of such mechanisms is often postulated, there had been little evidence for this in the past. The study by Han and collaborators shows that master regulators within neurons can adjust the balance between excitation and inhibition. Conclusions for EuroEPINOMICS. Both patients with smaller 22q13 duplications affecting SHANK3 alone had epilepsy as a concomitant phenotype. While the study by Han and collaborators touches upon many different aspects of the mouse model such as the hyperactivity phenotype and the unusual response to valproic acid, I believe that the epilepsy phenotype is most striking. While some genetic epilepsies are due to activating mutations in candidate genes, the current study suggests that increased expression of otherwise unaltered proteins may also be a mechanism for genetic epilepsies. The same mechanism may be relevant for other candidate genes, as well. This entry was posted in 2013, Epileptic encephalopathy, EuroEPINOMICS, Papers and tagged 22q13 deletion, actin cytoskeleton, Arp2/3 complex, excitatory synapse, excitatory/inhibitory balance, GABA, glumate, inhibitory synapse, microdeletion, microduplication, Phelan-McDermid Syndrome, SHANK2, SHANK3, terminal deletion. Bookmark the permalink.